Can You Really Make Money Writing For eCommerce Insiders? I found this website while researching new websites that would hire freelance writers. I have been looking pretty seriously into freelancing as a side-hustle lately, so I have been researching website that hire writers in an attempt to find some new, awesome, and profitable potential clients. This site seemed cool, though I had admittedly never heard of it before. Can you really make money writing for eCommerce Insiders? The Basics: What Is eCommerceinsiders.com? This website is actually a site dedicated almost completely to e-commerce-type topics (which is actually kind of obvious as the name suggests this). Upon first visiting the site, I was greeted with a simple layout that was as much business-like as it was basic. It has an almost blog-like feel to it, which I rather liked. In fact, there were times when it almost felt too ‘empty’ to me, which was different. Usually, I feel like websites are too cluttered for my taste. But hey—being too empty is not really that big of a problem. If anything, it gives my eyes room to breathe and focus as I scan the site. There is a simple menu bar tab along the top of the site, as well as a section for article topics that you can browse. The ‘about us’ tab literally took me to a page that had only one sentence. Here is what it said. And that was it. 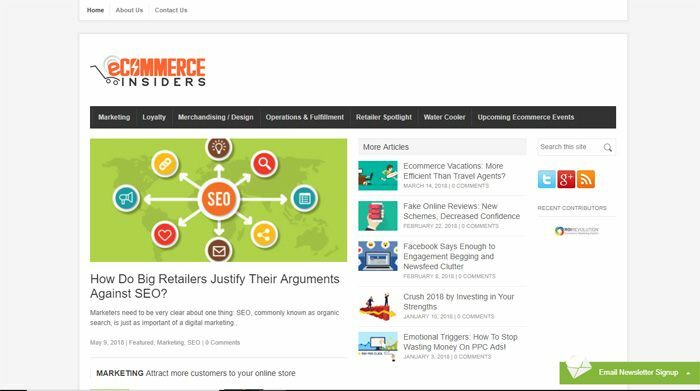 But, it was simple and to the point, and did a good job of getting right down to the business of what eCommerceInsiders.com was designed to do. But my next question was about the content. How good were the articles published on the site? How high was the level of quality? What kind of style did this site tend to stick with when they hired freelancers? These were all questions that I wanted to find answers for, so I did some additional research and read through some of the content posted on their landing page. Here is what I discovered. The first article that I checked out was about SEO, and it was quite well done. It was brief and to-the-point, but I felt like it was written from the perspective of someone who knew what they were talking about. The next article that I read was about Influencer Marketing, and I was pretty pleased with this article as well. This article was a bit more opinionated than the last one. I felt like the writer took more liberty with their stance on this one, but at the same time, I didn’t disagree with what they were saying. Once again, I felt like the content was coming from a place of knowledge and experience. I am not totally sure if these writer profiles on this site are real, or if they are changed a bit (sometimes, websites either generate or change author bios a bit, for one reason or another), but either way, the writers of these pieces were quite good! So next, I decided to look into what it would take to write for a website like this. Here is what I discovered. It took a little bit to actually find this page, as I had to use the search bar and type ‘write for’ to get it brought up. I am not sure where in the site you need to look to find it, but I did find it—and that is pretty much all that matters. So the first thing that I noticed was this. They say right at the top of the page that they are currently not accepting new applications for contributors. But, they also say that this is subject to change, so people who are interested should keep checking back. Still, let’s take a look at what kind of writing gig this actually is. They also ask that you only apply if you have specific ecommerce experience, or experience in a directly relevant field. They also do not consider applications without links to writing samples. You are also supposed to include at least one pitch for an article when you apply to the site. eCommerceInsiders.com is actually pretty unique among some of the writing sites that we have looked into because they openly list what they pay for content. Here is what they pay for articles of different lengths. They pay out per-month to all of their writers, but they also reserve the right to reject content that they do not want to publish—which is quite understandable. And that about covers the information listed on their website. But before I give my personal feelings about the site, I would like to talk a bit about writing as a side-hustle in-general, to give some context before giving my official opinion. Before we dive too deeply into this (or any other) website that could potentially offer you the chance to sell your freelance writing skills online, let’s first discuss a few important things that every prospective freelancer needs to know. 1… It is important to know that freelancing is not a ‘get rich quick’ plan. Freelancing is hard work, and you will likely face some rejections along the way. So even if you do make great money on an article, remember that you will have to balance this out with a few articles that may never get published. 2… Writing for one website will likely not add up to any meaningful level of side-cash. If you really want to make money writing for websites, then you will probably have to submit to several different sites and try to sell different articles to several different publications. You can also try to sell rejected articles to different publications as well. 3… Freelancing can earn you some awesome extra cash. But at the same time, it is also important to understand that it may take time to generate the kind of income that you would like to earn. You will have to commit to it, build up your craft, and work to establish a name for yourself. I cannot say this enough… freelancing is NOT a get-rich-quick kind of gig. It takes hard work and dedication—but it can also really pay well. Personally, I liked how this site looked. I also liked the kind of content that they posted. I am a pretty big fan of reading about eCommerce, so this site was particularly interesting to me. I realize that they are not currently looking for writers, but that does not mean that they won’t be opening up hiring sometime in the future. And honestly, I feel like this is the kind of site that might be great to keep an eye on. As for how much they pay, their rates are above average for websites of their type—which I really liked. I have no doubt that you could make some great money writing for this site, though this also means that they are probably competitive for writers, since they pay so much that they likely attract a LOT of potential freelancers. So the main thing to keep in mind here is that persistence is the key. If you want to write for the better websites, you need to keep at it and work your way inside the door. You need to establish a name and a reputation, and increase your odds of getting noticed. This can take time and commitment, but it can be well-worth-it if you really want to make extra money freelancing. I can tell you from experience that freelancing is a profitable way to make extra money, but it is also not necessarily an ‘easy’ way to do it either. But, if this is a path that you would like to try, then I think that eCommerceInsiders.com could potentially be an awesome site to pitch to (once they start accepting applications again, anyway). If you have any kind of eCommerce experience and have some quality samples already posted on other sites, then this could be a great way to earn a bit of extra coin along the way! Should you try to write for this site and make some extra money as a freelancer?